Slot games are benefitting from a very big popularity among the gambling population. The reason for this is simple – the games themselves are simple, and anyone can pick them up and play them. Moreover, they feature exciting, interesting animations, sounds, music and backstories; which makes it all the more enticing for you to start playing a particular slot game. If there’s one game that we’d like to recommend to you based on the merits of the backstory, it’s the Creature from the Black Lagoon slot game. Continue to read this article in order to find out why. If you’re a fan of movies, then you might have heard about the classic called Creature from the Black Lagoon. It’s a movie about a team of explorers on a mission at the Amazon river to explore the area for something interesting. And as the story goes; they will eventually face the scary monster that lurks in the area. If you have seen and liked this movie, you will definitely like this game as you will have an opportunity to see the movie again in the form of a slot game. You will be able to reunite with your favorite characters, plus the monster itself. And the music that plays in the background while you’re playing this slot game is simply beautiful – a bit quiet and mellow, but it definitely helps to set the scene up. The graphics are to the tune of the movie; which, as you know, is made in the second half of the last century, which makes it an old movie. So, the colors of the game are a bit faded; and the game itself is made in every way possible to be reminiscent of the movie itself. There are various symbols in this game – and they are all related to the movie. For example, the symbols of the lowest value are various items that are used in an exploring expedition – such as the knife, the binocular and the underwater breathing equipment. And the symbols of high value are the characters of the movie: Lucas, Carl, David and Kay. 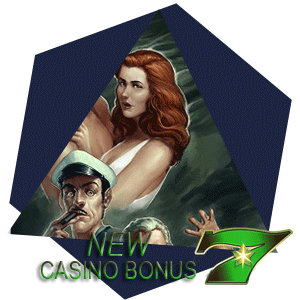 Kay is the most valuable symbol of the game; and if you can make a winning combination along the pay line with her symbol, then you will get loaded with money. Which brings us to the next subject – the game features 20 fixed pay lines. This will give you ample opportunities to make a winning combination with the help of the symbols. There are five reels and three rows. There are bonus features as well – first, you will have the wild symbol. The thing about this game is that the wilds are sticky, meaning they will stick for an additional turn of the wheel. There are spreading wilds which will take entire reels, and there are free spin symbols which will give you 10, 15, or 20 free spins, depending on how many free spin symbols you get in as spin. This is a great game, period. Of course, it may not be loaded with bonus features, but the overall feel of the game and how smoothly it goes, the chatter of the characters of the game and some other various details will give you the full impression like you’re actually inside the movie. Enjoy playing it!